You ask, we answer! Cache Crawler is now available within our Magento Page Cache extension. The feature is also known as Cache Warmer. It was added in order to improve cache hit/miss rate. As you probably know, an increased hit rate will have an effect on the overall cost of sales. Applied the crawler, you will bring better experience for every visitor browsing your store. If you are running the website with high traffic, you need it to be the fastest. The crawling the website will decrease web-pages load time to a minimum. Overall it will be good thing for user shopping experience. Won't it? Our Cache Crawler supports multi store set-up. You are allowed to run the crawler for CMS, category and product pages. Multiple URL sorces are supported. Our up-to-date crawling will absolutely give your website best practice - best speed, best response time, best load time. Some of non-complex steps and your website is on top of the world. This entry was posted in Magento extensions on May 25, 2015 by TemplatesMaster. All our modules help you to improve your store usability. Let us catch you up with new great idea for your Magento store product page! The point is that to show much more product’s advantages to your customers, is the most effective way to encourage them to buy. Say Yes to the display of product video right on the product page. It will make the page more informative and attractive. New visitors will surely stop their eyes on the video. 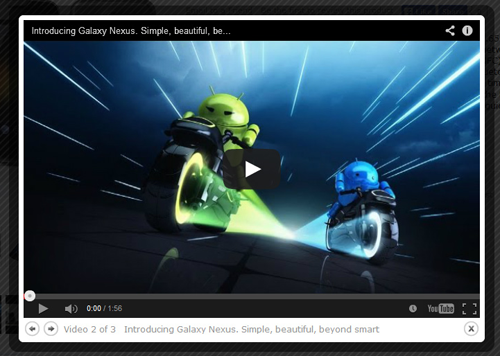 By adding the video gallery you can give users a lot of reasons to buy the product. That finally will help them to take positive purchase decision. Using two layout types that can be switched optionally in configuration. So, you can set the video thumbnails under the product images or in tabs. Changing the width and the height popup window settings. Customizing a size of the video thumbnail. Set up of embedded video transition, transition speed and overlay opacity configs. Wanna to make a product page more efficient using the videos? Just check the Product Videos extension! Quite soon you will see the increase of conversion rate of your product pages. If you’re still hesitating, please notice, that our new extension is fully integrated with default magento zoom, ProZoom, Lightbox Pro, Easy Lightbox and Ultimo (Infortis) CloudZoom. So, now you can easily place the embed video at the product page in your Magento store. Go to https://templates-master.com/magento-product-videos-module.html and let us to help in driving your website’s revenue. This entry was posted in Magento extensions, News on December 11, 2014 by TemplatesMaster. Make your store more interactive with new absolutely free Testimonials extension! We do need to fill you in on very great and useful Magento extension. 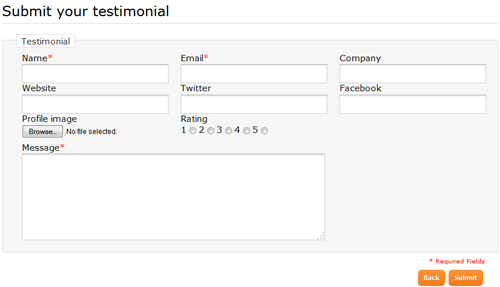 It will help you to monitor the user’s impressions about your store placing testimonials form. If you’re really interested to know how customers estimate your store services - let's allow them to post testimonials at your store! So, you see? It’s actually great idea to try this new extension in order to make your customers more pleased with your store offerings. You know, because by placing reviews from your satisfied customers, you will surely transform your sales into advertising for your store. Let’s talk about Testimonials backend. The configuration provides wide range of different settings of testimonials list and submit form. You can use the default Magento widget interface in order to to place testimonials widgets. Additionally you can specify the number of testimonials in widget as well as to change animation duration. Be sure, you will get an email notification each time a testimonial is submitted for review. Push your customers to post their reviews. This is really effective way to increase your store credibility. Go to https://templates-master.com/free-magento-testimonials-extension.html and quite soon you will meet happy clients! This entry was posted in Magento extensions, News on December 2, 2014 by TemplatesMaster. Our new CDN extension allows you deeply integrate your Magento store with CDN networks and greatly decrease your store page load time. Magento is a leading ecommerce platform now used by a large number of both large and small ecommerce companies. But one of the biggest challenges for major part of store owners is making Magento faster without spending large budget on hosting resources. It’s quite obvious that slow Magento websites will cost sales and it will got your customers down. An easy and low cost way of increasing your store performance is incorporating a Content Delivery Network (CDN) for distribution of your media content to your visitors. Our Magento CDN plugin will help you to integrate most popular CDN providers in your Magento store. Installation and configuration is quite easy and all your need to do is simply select right settings in Magento Admin Panel after uploading files. 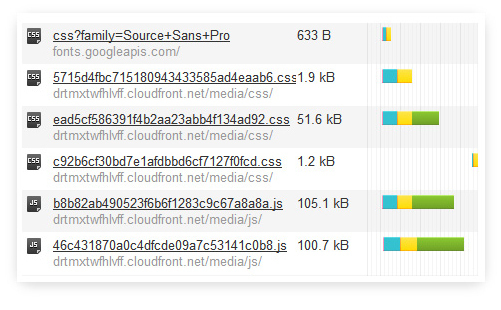 CDN implementation will lets your visitors benefit from faster page loads that will lead to increased sales conversions. Please find more detailson the Magento CDN extension page. This entry was posted in Magento extensions, News on July 24, 2014 by TemplatesMaster. Today we are glad to introduce our new extension created to make your store navigation better and to improve your landing pages design. It will help you to organize products from multiple manufacturers or genres. Magento Brands extension will help you to create attractive attributes and brands pages, improve your navigation with brands widgets. Please check sample of brand listing page that is supported right out of the box. 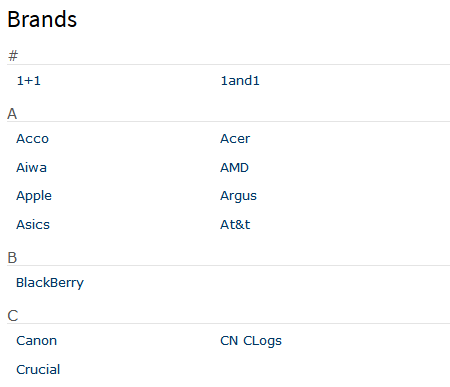 All brands are grouped in alphabetical order and listed in several columns. 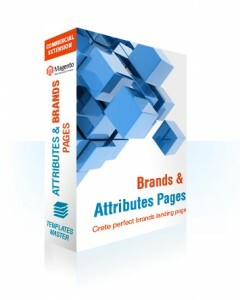 Such type of pages works good for stores offering wide range of products. You can use almost any attribute such as brand, color, book author or film genre for attributes page. As soon as you create your first attributes page you can add our attributes widget to your store. For example it can be brands listing slider like shown bellow. Our extension already completely integrated with our Magento Navigation extension. So for example you can create drop-down list of all brands like shown bellow just in few minutes. Please find more information on the Magento Brands extension page. This entry was posted in Magento extensions on December 17, 2013 by TemplatesMaster.